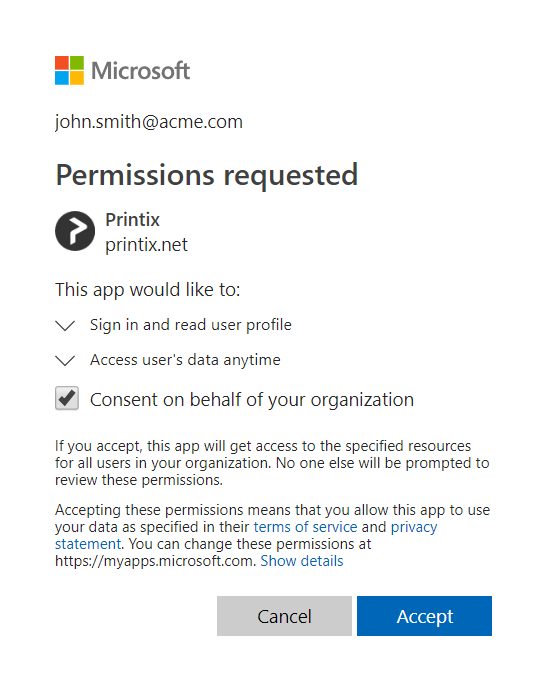 Enable this to allow users to sign in with their Microsoft work or school account and get federated single sign-on (SSO) to Printix. You just need a user account in Azure AD to configure Azure AD integration. Select Accept for all users to grant permission to read users’ profiles without prompting the individual in your organization. You must have the role as global admin in Azure AD to do this. Enter your administrator account. You must have the role as global admin in Azure AD to grant permission to read users’ profiles. Select Accept to grant these permissions, so Printix can have access to the specified resources for all users in your organization. No one else will be prompted. If this is successful you will see the message: Accepted for all users. 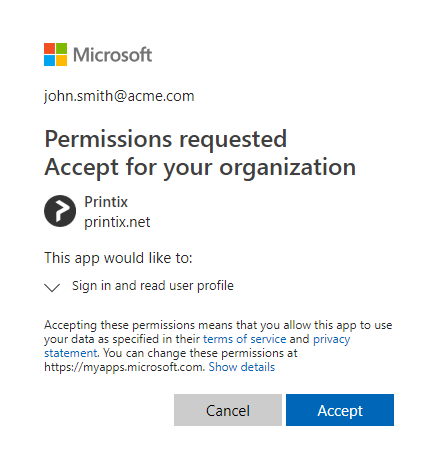 How to revoke the acceptance of Printix? On the Enterprise applications blade, select Printix. Azure authentication is not enabled. RESOLUTION: You may have forgotten to select Save after you connected to Azure AD. If it still does not show, then try to refresh the browser (Ctrl + F5). After you select Accept for all users and Sign in you get Permission denied. RESOLUTION: You must sign in with a a role as global admin in Azure AD after you select Accept for all users. The first time you Sign in with Microsoft, a new user is automatically created for you. This new user is not authorized to Sign in to Printix Administrator. RESOLUTION: Sign in with email to Printix Administrator, and change the role of the newly created user to System manager. From now on you can sign in with your work or school account. 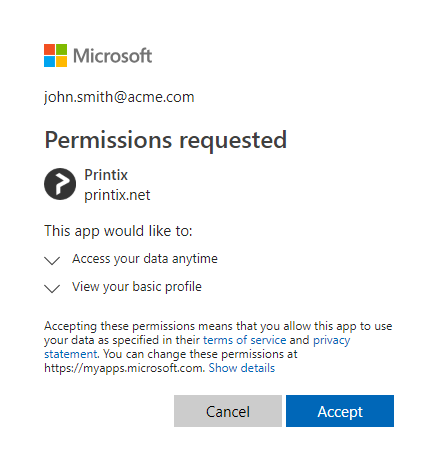 If you disable Azure authentication and want to withdraw the accept of Printix, then you must do this from within Azure AD. If you have withdrawn the accept of Printix and now want to accept Printix again, then select the Accept again link. After attempting to Sign in with Microsoft you are told you can not access Printix. RESOLUTION: Follow the steps below to allow users to consent to apps accessing company data on their behalf. You must have the role as global admin in Azure AD to make this change. Printix will read the users’ basic profile (display name and email address). On the User settings page under Enterprise applications, select Manage how end users launch and view their applications. Change Users can consent to apps accessing company data on their behalf to Yes. It may take up to 15 minutes before the change take effect.